The weeding effort for the 2018-19 season to the end of March was 603 hours, 98% within the Reserve (including the Extension). This was 11% more than the total for this period last season and 20% more than the effort on the Reserve alone last season but the second lowest of our 9 seasons of records. A further 150 h was spent on rescuing Themeda (kangaroo grass) from the route of the new Molonglo pipeline and transplanting it to a degraded patch of the Weetangera paddock as well as an additional 11 h spent on weed mapping. For the season to date St. John's Wort has received the most effort (216 h) followed by the group of uncategorised broadleaf weeds (126 h), African Lovegrass (52 h) Skeleton weed (41 h), and other Briars (31 h). Together these account for 77% of the effort so far this season. See the weeding effort page and associated links to maps and charts for more statistics and comparisons with previous seasons and across the different management regions of the Reserve. The weeding effort for the 2018-19 season to the end of February was 528 hours, 99% within the Reserve (including the Extension). This was 21% more than the total for this period last season and 34% more than the effort on the Reserve alone last season. The effort spent on weed control alone was the second lowest for the 9 seasons of records, but when the additional effort was included the total of 689 h was the fifth largest. For the season to date St. John's Wort has received the most effort (206 h) followed by the group of uncategorised broadleaf weeds (107 h), Skeleton weed (41 h), African Lovegrass (35 h) and other Exotic grasses 27 h). Together these account for 79% of the effort so far this season. The weeding effort for the 2018-19 season to the end of January was 431 hours, 99% within the Reserve (including the Extension). This was 27% more than the total for this period last season and 41% more than the effort on the Reserve alone last season. A further 151 h was spent on rescuing Themeda (kangaroo grass) from the route of the new Molonglo pipeline and transplanting it to a degraded patch of the Weetangera paddock as well as an additional 10 h spent on weed mapping. When all this effort is combined, the total of 592 h was the fifth largest of the 9 seasons of records. For the season to date St. John's Wort has received the most effort (156 h) followed by the group of uncategorised broadleaf weeds (89 h), Skeleton weed (41 h), Exotic grasses (excluding African Lovegrass (27 h) and Saffron Thistles (25 h). Together these account for 78% of the effort so far this season. The weeding effort for the 2018-19 season to the end of December was 323 hours, 98% within the Reserve (including the Extension). This was 34% more than the total for this period last season and 56% more than the effort on the Reserve alone last season. A further 151 h was spent on rescuing Themeda (kangaroo grass) from the route of the new Molonglo pipeline and transplanting it to a degraded patch of the Weetangera paddock as well as an additional 10 h spent on weed mapping. When all this effort is combined, the total of 474 h was the fifth largest of the 9 seasons of records. For the season to date St. John's Wort has received the most effort (98 h) followed by the group of uncategorised broadleaf weeds (66 h), Skeleton weed (40 h), Exotic grasses (excluding African Lovegrass (26 h) and Saffron Thistles (21 h). Together these account for 78% of the effort so far this season. The weeding effort for the 2018-19 season to the end of November was 218 hours, 99% within the Reserve (including the Extension). This was 55% more than the total for this period last season and 73% more than the effort on the Reserve alone last season. A further 147 h was spent on rescuing Themeda (kangaroo grass) from the route of the new Molonglo pipeline and transplanting it to a degraded patch of the Weetangera paddock as well as an additional 10 h spent on weed mapping. When all this effort is combined, the total of 375 h was the second largest of the 9 seasons of records behind 2012-13. When all this effort is combined, the total of 272 h was the fifth largest of the 9 seasons of records. For the season to date St. John's Wort has received the most effort (53 h, all in November)followed by the group of uncategorised broadleaf weeds (45 h) and Skeleton weed (40 h). Together these account for 64% of the effort so far this season. The weeding effort for the 2018-19 season to the end of October was 122 hours, entirely within the Reserve (including the Extension). This was 25% more than the total for this period last season and twice as much as the effort on the Reserve alone last season, but the second smallest total for the 9 years of records. A further 140 h was spent on rescuing Themeda (kangaroo grass) from the route of the new Molonglo pipeline and transplanting it to a degraded patch of the Weetangera paddock as well as an additional 10 h spent on weed mapping. When all this effort is combined, the total of 272 h was the second largest of the 9 seasons of records behind 2012-13. When all this effort is combined, the total of 272 h was the second largest of the 9 seasons of records behind 2012-13. For the season to date Skeleton weed has received the most effort (39 h) closely followed by the group of uncategorised broadleaf weeds (36 h) with Capeweed the only other category exceeding 10 hours. Skeleton weed has become an emerging problem on the Reserve, perhaps encouraged by the removal of other weed competitors. 09 Oct 2018: Just how dry is it this year? The answer is: very dry. An analysis of data from the two official Bureau of Meteorology rainfall stations closest to the Pinnacle (for which we have 45 years of records) shows that the rainfall to date this year (300 mm) is the third lowest behind 1994 (248 mm) and 2004 (246 mm). Nearly half of this rainfall (144 mm) fell in January and February, when its effectiveness is countered by high temperatures and uptake rates by plants. In the period from March to September there has only been 156 mm. This is the smallest total for those months in the 45 years of records. The next smallest for this period were 169 mm (1994) and 181 mm (2004). In terms of the impact of this dry year it is relevant that last year was also a relatively dry one (329 mm to September; 589 mm for the whole year) and a significant proportion fell in the warmer months of November and December. Monthly and annual rainfall since 2010 for the two weather stations used here is updated monthly on the fotpin website. For details see Spring walks program 2018 [ 1.1 MB] or keep up to date with "What's on". The dry conditions have increased the risk of falling trees and limbs. See Safety Alert for advice of how to minimise the risk. The weeding effort summary for the 2016-17 season shows that our effort was the smallest of the last 8 years, both for the Reserve* alone (623 hours) and for the Reserve and adjacent paddocks combined (696 hours). This largely reflects a decline in weeding volunteer numbers over the years. Compared with the average for the previous 6 seasons the total effort was 37% less but the effort spent on the Reserve alone was only 30% less. This is because with our reduced resources we have prioritised the Reserve and had to abandon a great deal of weed control in the adjacent paddocks. Despite the reduced effort, we are reasonably confident that all major weed targets were controlled to the same extent as in previous seasons. This is attributed to the dry winter that resulted in less weed germination and growth, improved efficiencies in our weed control and evidence that our past efforts have permanently reduced the severity of infestation by many of our target weeds reducing the amount of effort required. The weeds that absorbed most effort this season were St. John's Wort (202 hours, all on the Reserve), miscellaneous Broadleaf Weeds (104 h), Saffron Thistles (95 h), Verbascum (62 h), Briars (47 h) and African Lovegrass (40 h) which together accounted for 79% of the effort. * Note: effort for the Reserve now includes effort in the Extension, both in this season and in previous seasons. Works have commenced for the construction of the new pipeline between the Weetangera water tanks and the new suburb of Whitlam with the erection of temporary fencing to provide a secure construction site. A new web page has been created to keep members and other Reserve users informed of any construction activities that may affect them. In the first instance it foreshadows the restricted access that will apply along some of the tracks. The weeding effort for the 2017-18 season to the end of May (667 hours) was the smallest of the last 8 seasons. This is partly because of the very low rainfall in 2017; the rainfall for the calendar year was the lowest since 2009 despite the wet finish to the year. As a result there were initially fewer of the weeds we normally target in evidence. The above average rainfall in October, November and December generated the requirement for increased effort, but volunteer availability has been limited resulting in the total effort remaining low. In May St. John's Wort received most effort (32 h) followed a long way behind by Verbascum (12 h), (11 h), Nightshade (10 h), and Briars (8 h). These accounted for 81% of the month's effort. For the season to date Miscellaneous Broadleaf weeds received most effort (18 h) followed a long way behind by Woody Weeds (5 h), St. John's Wort (4 h), Verbascum (12 h), African Lovegrass (3 h) and Nightshade (2 h). These accounted for 92% of the month's effort. The weeding effort for the 2017-18 season to the end of April (632 hours) was the smallest of the last 8 seasons. This is partly because of the very low rainfall in 2017; the rainfall for the calendar year was the lowest since 2009 despite the wet finish to the year. As a result there were initially fewer of the weeds we normally target in evidence. The above average rainfall in October, November and December generated the requirement for increased effort, but volunteer availability has been limited resulting in the total effort remaining low. In April St. John's Wort received most effort (32 h) followed a long way behind by Verbascum (12 h), Miscellaneous Broadleaf weeds (11 h), Nightshade (10 h), and Briars (8 h). These accounted for 81% of the month's effort. For the season to date St. John's Wort (198 h), Saffron Thistles (95 h), miscellaneous Broadleaf weeds (66 h), Verbascum ( 62 h) and Briars (47 h) have received the most effort. Together these accounted for 74% of the effort. The weeding effort for the 2017-18 season to the end of March (542 hours) was the smallest of the last 8 seasons. This is partly because of the very low rainfall in 2017; the rainfall for the calendar year was the lowest since 2009 despite the wet finish to the year. As a result there were initially fewer of the weeds we normally target in evidence. The above average rainfall in October, November and December generated the requirement for increased effort, but volunteer availability has been limited resulting in the total effort remaining low. Spraying of Briars received the most effort for March (23 h) with significant amounts of time also devoted to Nightshade, St. John's Wort and Verbascum. These accounted for 67% of the month's effort. St. John's Wort (167 h), Saffron Thistles (95 h), Verbascum ( 50 h), miscellaneous Broadleaf weeds (50 h) and Briars (39 h) have received the most effort. Together these accounted for 74% of the effort. The weeding effort for the 2017-18 season to the end of February (435 hours) was the smallest of the last 8 seasons. This is partly because of the very low rainfall in 2017; the rainfall for the calendar year was the lowest since 2009 despite the wet finish to the year. As a result there were initially fewer of the weeds we normally target in evidence. The above average rainfall in October, November and December generated the requirement for increased effort, but volunteer availability has been limited resulting in the total effort remaining low. Spraying of St. John's Wort dominated the effort for February (52% of effort) with significant amounts of time also devoted to Saffron Thistles and Briars. St. John's Wort (148 h), Saffron Thistles (94 h), miscellaneous Broadleaf weeds (44 h) and Verbascum (38 h) have received the most effort so far this season. Together these accounted for 75% of the effort. The weeding effort for the 2017-18 season to the end of January (338 hours) was the smallest of the last 8 seasons. This is partly because of the very low rainfall in 2017; the rainfall for the calendar year was the lowest since 2009 despite the wet finish to the year. As a result there were initially fewer of the weeds we normally target in evidence. The above average rainfall in October, November and December generated the requirement for increased effort, but volunteer availability has been limited resulting in the total effort remaining low. Spraying of St. John's Wort dominated the effort for January (55% of effort) with significant amounts of time also devoted to Saffron Thistles, miscellaneous Broadleaf weeds and African Lovegrass. St. John's Wort (98 h), Saffron Thistles (73 h), miscellaneous Broadleaf weeds (40 h) and Verbascum (36 h) have received the most effort so far this season. Together these accounted for 72% of the effort. For details see Autumn walks program 2018 [ 0.6 MB]. The weeding effort for the 2017-18 season to the end of December (240 hours) was the smallest of the last 8 seasons. This is partly because of the very low rainfall this year; the rainfall for the calendar year was the lowest since 2009 despite the wet finish to the year. As a result there were initially fewer of the weeds we normally target in evidence. The above average rainfall in October, November and December generated the requirement for increased effort, but volunteer availability has been limited resulting in the total effort remaining low. Spraying of St. John's Wort dominated the effort for December (60% of effort) with significant amounts of time also devoted to Saffron Thistles and African Lovegrass. Saffron Thistles (55 h), St. John's Wort (49 h) Verbascum ( 34 h), Capeweed (25 h) and miscellaneous Broadleaf weeds (26 h) have received the most effort so far this season. Together these accounted for 79% of the effort, with Paterson's Curse, accounting for much of the remainder. The weeding effort for the 2017-18 season to the end of November (162 hours) was the smallest of the last 8 seasons. This is largely because of the very low rainfall this year; the rainfall for the calendar year to the end of November is the lowest since 2008 despite the wet October and November. As a result there have been fewer of the weeds we normally target in evidence. Recent rains in October and November are expected to generate the requirement for increased effort. Saffron Thistles (39 h), Verbascum ( 32 h), Capeweed (25 h) and miscellaneous Broadleaf weeds (20 h) have received the most effort in this period. Together these accounted for 71% of the effort, with Paterson's Curse, accounting for the bulk of the remainder. The weeding effort for the 2017-18 season to the end of September (41 hours) was the smallest of the last 8 seasons. This is largely because of the very low rainfall this year; the rainfall for the calendar year to date is the lowest since 2008 and the 6th lowest since 1974. As a result there are few of the weeds we normally target in evidence. The weeding effort for the 2017-18 season to the end of October (97 hours) was the smallest of the last 8 seasons. This is largely because of the very low rainfall this year; the rainfall for the calendar year to the end of September was the lowest since 2008 and the 6th lowest since 1974. As a result there have been few of the weeds we normally target in evidence. Recent rains in October and early November are expected to generate the requirement for increased effort. Capeweed (25 h) closely followed by Saffron Thistles (23 h) then miscellaneous Broadleaf weeds and Verbascum (both 14 h) have received the most effort in this period. Together these accounted for 78% of the effort, with Paterson's Curse, Sweet Briars and Horehound accounting for the bulk of the remainder. Another Spring and another nesting season at the Pinnacle for the local birds and migratory species alike. Come along for a gentle stroll through the reserve’s woodlands to see what we can find. If you’d like to join us, just turn up with your binoculars and/or your camera. Wear sturdy footwear (we’ll probably be going off-track at least some the time), dress for the weather and bring along some water. My walks usually finish by around 11 or 11.30, so you’ll be home in plenty of time for lunch. Last year’s walk to this new extension to the reserve was quite lovely. This year we’ll again be walking down through the reserve into the new area, which looks out over the neighbouring Kama Nature Reserve and the Molonglo Valley. Join our specialist plant guides to check out the gorgeous native wildflowers and take a look at the work being done by the PCS rangers to turn this promising patch back into grassy box-gum woodland and native grassland. Dress for the weather and wear sensible footwear as we’ll be going off the track for some of the walk. Bring along some water and a bit of morning tea if you like, and don’t forget your camera — some of the views are stunning! The round trip will be about 4-5 km in all and we expect to be back at the car park by around 11.30. The Kangaroos page results section has been updated to include the 2016 cull number and the 2017 count number. The 2017 cull number is not yet available. The results show that the 2016 cull kept the kangaroo numbers at about the same level as last year and very close to the estimated "conservation density" appropriate for the Pinnacle Kangaroo Management Unit. The 2017 revised Kangaroo Management Plan has also been added to the links section at the bottom of the Kangaroos page and a few small changes made to keep it up to date. The weeding effort summary for the 2016-17 season shows that our effort was the smallest of the last 7 years, both for the Reserve* alone (688 hours) and for the Reserve and adjacent paddocks combined (754 hours). This largely reflects a decline in weeding volunteer numbers over the years and specifically the departure in early 2016 of Pax, who contributed almost a third of our weeding effort in many years. Compared with the average for the previous 6 seasons the total effort was 35% less but the effort spent on the Reserve alone was only 26% less. This is because with our reduced resources we prioritised the Reserve and had to abandon a great deal of weed control in the adjacent paddocks. Despite the reduced effort, we are reasonably confident that all major weed targets were controlled to the same extent as in previous seasons. This is attributed to the dry summer that resulted in less weed germination and growth, improved efficiencies in our weed control and evidence that our past efforts have permanently reduced the severity of infestation by many of our target weeds reducing the amount of effort required. The weeds that absorbed most effort this season were St. John's Wort (202 hours, all on the Reserve), Verbascum (146 h, 122 h on the Reserve) and Saffron thistles (99 h, 68 h on the Reserve) which together accounted for 60% of the effort. * Note: effort for the Reserve includes effort in the Extension, both in this season and in previous seasons. The weeding effort for the 2016-17 season to the end of April (711 hours) was the smallest of the last 7 years, and 36% less than last year reflecting a large decrease in available volunteer time. However, the effort spent on the Reserve alone was only 21% less than last year. The main weeds targeted so far this season have been St. John's Wort (202 hours), Verbascum (139 h) and Saffron thistles (99 h) which together have accounted for 62% of the effort. After the driest summer for 15 years, not too many of our primary weed targets were growing on the Pinnacle at the beginning or March. Coupled with the large number of wet days that followed in March this resulted in quite a small weed control effort for the month. The weeding effort for the 2016-17 season to the end of March (646 hours) was the smallest of the last 7 years, and 34% less than last year reflecting a large decrease in available volunteer time. However, the effort spent on the Reserve alone was only 19% less than last year. The main weeds targeted so far this season have been St. John's Wort (190 hours), Verbascum (115 h) and Saffron thistles (99 h) which together have accounted for 62% of the effort. The weeding effort for the 2016-17 season to date (599 hours) was the smallest of the last 7 years, and 25% less than last year reflecting a large decrease in available volunteer time. However, the effort spent on the Reserve alone was only 15% less than last year. The main weeds targeted so far this season were St. John's Wort (177 hours), Verbascum (101 h) and Saffron thistles (98 h) and which together have accounted for 63% of the effort. In February Briars received most effort (31%), with the bulk of the first spraying sweep included in the month, followed by Verbascum (18%), most of which was the bagging and spraying of Verbascum in a 50 m buffer zone outside the Reserve boundaries with Bottom Pinnacle and North Kama. Next was St John's Wort (16%), with a tentative commencement of a third sweep for the season, followed by Prickly Lettuce (14%) which, after being largely absent for a few years has enjoyed the climatic conditions of this season and been flourishing. With the bagging of non-Saffron Thistles in the Extension (9%) these weeds accounted for 87% of the month's effort. The weeding effort for the 2016-17 season to date (513 hours) was the second smallest of the last 7 years, and a third less than last year reflecting a large decrease in available volunteer time. However, the effort spent on the Reserve alone was only 17% less than last year. The main weeds targeted so far this season were St. John's Wort (164 hours), Saffron thistles (94 h) and Verbascum (86 h) which together have accounted for 67% of the effort. St. John's Wort also dominated the month of January, accounting for 38% of the effort. We finished our second sweep spraying St. John's Wort on 31st January (see Recent Weeding for details) and expect to need to commence a third sweep soon. The spraying of Briars, Blackberries and other Woody Weeds across the Reserve commenced in January and will be completed by mid-February. Indications to date are that numbers of Briars and Blackberries are down on last year. The weeding effort for the 2016-17 season to date (367 hours) was the second smallest of the last 7 years, and a third less than last year reflecting a large decrease in available volunteer time. However, the effort spent on the Reserve alone was only 25% less than last year and for the month of December was close slightly greater than the average of the preceding 6 years. Therefore, despite having many fewer active sprayers and other weeders, weeds on the Reserve are receiving adequate attention. The main weeds targeted so far this season were St. John's Wort (109 hours), Saffron thistles (73 h) and Verbascum (69 h) which together have accounted for 68% of the effort. St. John's Wort also dominated the month of December, accounting for 45% of the effort. We finished our first sweep spraying St. John's Wort on New Year's eve and commenced the second sweep (to spray plants that the early summer rain encouraged) on 4th January (see Recent Weeding for details). The summary of weeding effort for the 2016-17 season has been updated to the end of November. The effort for the season to date (253 hours) was the smallest of the last 7 years, and a third less than last year reflecting a large decrease in available volunteer time as well as the very wet winter and early spring. However, the effort in November was close to the average of the preceding 6 years and greater than average for effort spent on the Reserve alone. The main weeds targeted so far this season were Verbascum (61 hours), St. John's Wort (58 h) and Saffron thistles (54 h), followed by Capeweed (29 h) and Paterson's Curse (25 h). Together, these accounted for 90% of the effort to date. The main weeds targeted in November were St. John's Wort and Verbascum which together accounted for 70% of the effort. See the weeding effort page and associated links to maps and charts for more details. The first summary of weeding effort for the 2016-17 season is now available. The first four months of the season have been fairly quiet, with 140 hours total effort, 45% (115 h) less than last season. This reflects a large decrease in available volunteer time as well as the very wet winter and early spring. The main weeds targeted were Saffron thistles (43 hours), Verbascum (30 hours) and Capeweed (29 hours) which together accounted for 75% of the effort. Paterson's Curse and St. John's Wort also each received more than 10 hours of effort. The 6th fotpin AGM was held on Sunday 24 July at the Weetangera Primary School. The meeting was attended by 15 members. recent track works on the Reserve. Two new reports have been uploaded - the annual summary/review of the 2014-14 weeding season and the weeding effort report for the first three months of the 2015-16 season. The first three months of the season were fairly quiet, as usual, with 97 hours total effort, exactly the same as for last year. The main paddock targeted was Bottom Pinnacle (39 hours). The main weed targeted was Saffron thistles (34 hours, mostly spraying), with the grubbing of miscellaneous Broadleaf weeds also receiving a large amount of effort (25 hours). Draft Minutes of the meeting will shortly be posted on the governance page, where the Convenor's Report and Audited Financial Statement for 2015-16 may also be found. The weed control effort slowed considerably this month with the onset of the cooler weather, with the monthly total of 41 hours (17 h on the Reserve) being less than a third of the average of the previous 7 months. This brought the total for the season to date (since 1 July) to 1050 hours, 9% (95 h) more than last season. The amount of time spent on the Reserve itself (754 h) was 14% more than last season. Verbascum received the most effort for the month (29% of total effort). St. John's Wort was was the weed type receiving most effort in the season to date (27%), followed by Verbascum, miscellaneous Broadleaf weeds, Saffron thistles and Briars. 66% of total effort for the month was spraying. The 2016 Pinnacle Kangaroo Count was carried out on Sunday 22nd May by a total of 32 fotpin members and friends assisted by Don and Mel from ACT Conservation Research and Planning. Although we were a bit short on numbers we still managed to produce an excellently reproducible result of 291 in the morning and 295 in the afternoon. Read all about it on the 2016 kangaroo count web page. For the first time, last year's cull dropped the kangaroo density down below the "conservation density", the value estimated by CREP to be the density below which kangaroos do not have an impact that adversely affects other components of the ecosystem. Despite a record (for the Pinnacle) population growth rate over the last year, the density was still at the conservation density when we did the count. 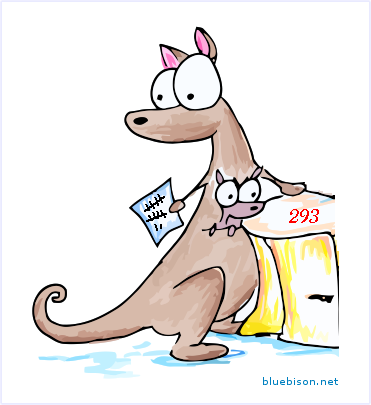 See the results section of the kangaroo page for the complete history of our counts and the Pinnacle kangaroo population density. This was another busy month, with 133 hours of effort recorded, 87 hours spent on the Reserve. This brought the total for the season to date (since 1 July) to 1010 hours, 24% (210 h) more than last season, and the third highest total for our 6 recorded seasons. The amount of time spent on the Reserve itself (736 h) was 19% more than last season, but only fourth highest of the last 6 seasons. Verbascum received the most effort for the month (24% of total effort). St. John's Wort was was the weed type receiving most effort in the season to date (28%), followed by Verbascum, miscellaneous Broadleaf weeds, Saffron thistles and Briars. 66% of total effort for the month was spraying. The PCS Rangers have been in touch to let us know that they’ll be doing some work on the tracks at the Reserve during May (beginning May 9th). Some of you may already have noticed a large pile of dirt on the Central Track a little way southwest of the Pinnacle summit. That will be used to “formalise” an existing informal track that runs down the southern slope of the Pinnacle (shown in orange on the map referred to below). 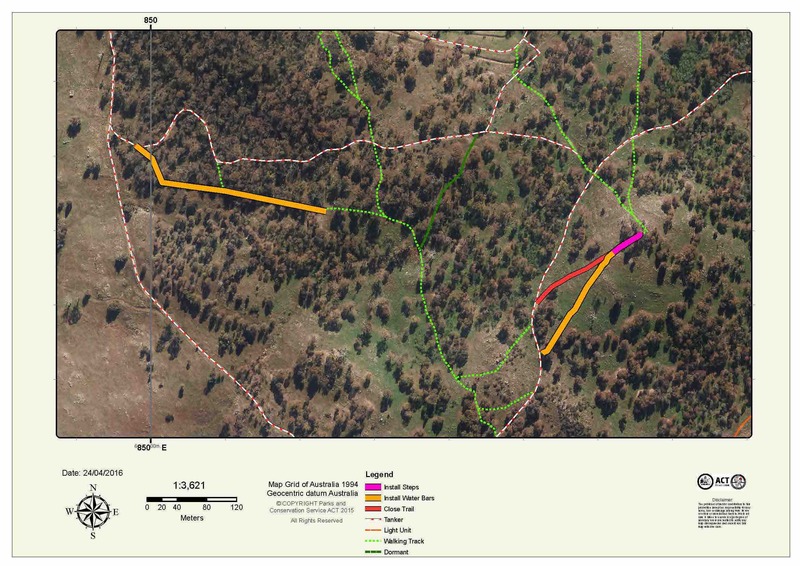 At the same time, they will close off a section of the existing track down that slope (marked in red) and install some red-gum logs at the top of the slope to form steps. The aim is to prevent further erosion and to direct walkers away from an area that is likely habitat for the Pink-tailed Worm Lizard (Aprasia parapulchella), which is listed as vulnerable in the ACT and NSW. PCS is also planning some further erosion control work on the path that runs along the southern edge of the stringybark forest, which is also shown in orange on the map. The map of the western half of the reserve shows where the works will happen. The work will involve some heavy machinery, so don’t be too alarmed if you see things that look like they belong on a building site. It’s all in a good cause! ParkCare has advised that the insurance arrangement covering volunteers undertaking work on unleased land in the ACT has changed. The ACT Government internal insurer ACT Insurance Authority (ACTIA) is covering the personal injury insurance from 1 April 2016. One of their requirements is that each volunteer must register individually. This is because volunteers will have the same rights and responsibilities as, and be treated in a similar fashion to, an employee of the ACT Government, in accordance with the Workplace Health and Safety Act 2011. Each employee is registered individually, and so each volunteer will be also. The information is held in strict confidence, in accordance with the Information Privacy Act 2014. Registration has been put on hold because of problems with the online registration form. We will let you know when it is available again. This was another busy month, with 127 hours of effort recorded, 55 hours spent on the Reserve. This brought the total for the season to date (since 1 July) to 977 hours, 26% (204 h) more than last season, and the second highest total for our 6 recorded seasons. The amount of time spent on the Reserve itself (649 h) was 11% more than last season, but only fourth highest of the last 6 seasons. Verbascum received the most effort for the month (34% of total effort). St. John's Wort was was the weed type receiving most effort in the season to date, followed by Verbascum, miscellaneous Broadleaf weeds, Saffron thistles and Briars. 64% of total effort for the month was spraying. This was another busy month, with 132 hours of effort recorded, 59 hours spent on the Reserve. This brought the total for the season to date (since 1 July) to 849 hours, 28% (188 h) more than last season, but equal to the second highest total for the previous 5 seasons. The amount of time spent on the Reserve itself (694 h) was 16% more than last season, and the largest for 5 seasons. St. John's Wort received the most effort for the month (28% of total effort) and was also the weed type receiving most effort in the season to date. For the season to date, St. John's Wort was followed by Verbascum, miscellaneous Broadleaf weeds, Saffron thistles and Briars. 67% of total effort for the month was spraying. This was our second busiest month of the year, with 158 hours of effort recorded, 119 hours spent on the Reserve and 39 hours on the neighbouring paddocks. This brought the total for the season to date (since 1 July) to 717 hours, 42% (212 h) more than last season, but only 30 h less than the previous two seasons. The amount of time spent on the Reserve itself (535 h) was 35% more than last season, and similar to the average of the previous 5 seasons (533 h). St. John's Wort received the most effort for the month (35% of total effort) and was also the weed type receiving most effort in the season to date. For the season to date, St. John's Wort was followed by Verbascum, miscellaneous Broadleaf weeds, Saffron thistles and Briars. 68% of total effort for the month was spraying. This was our busiest month for 2 years, with 159 hours of effort recorded, 117 hours spent on the Reserve and 42 hours on the neighbouring paddocks. This brought the total for the season to date (since 1 July) to 560 hours, 60% (212 h) more than last season, but only 24 h less than the previous season. The amount of time spent on the Reserve itself (417 h) was 67% more than last season, and greater than the average of the previous 5 seasons (388 h). St. John's Wort dominated the effort for the month (70% of total effort) and was also the weed type receiving most effort in the season to date, followed by Verbascum, Saffron thistles, miscellaneous Broadleaf weeds and African Lovegrass. 66% of total effort for the month was spraying. This was our second busiest November of the last 6 years, with 146 hours of effort recorded, 114 hours spent on the Reserve and 32 hours on the neighbouring paddocks. This brought the total for the season to date (since 1 July) to 400 hours, 35% (104 h) more than last season, but close to the average of the previous 5 seasons (286 h). The amount of time spent on the Reserve itself was 47% more than last season, but close to the average of the previous 5 seasons (186 h). St. John's Wort and Verbascum dominated the effort for the month (55% of total effort) and are also the weeds receiving most effort in the season to date, followed by Saffron thistles, miscellaneous Broadleaf weeds and African Lovegrass. 67% of total effort for the month was spraying. This was our busiest October of the last 6 years, with 157 hours of effort recorded, 133 hours spent on the Reserve and 24 hours on the neighbouring paddocks. This brought the total for the season to date (since 1 July) to 255 hours, 38% (70 h) more than last season, but about the same as the two seasons before that. The amount of time spent on the Reserve itself was 77% more than last season, but almost exactly the same as the average of the previous 5 seasons (181 h). Verbascum and St. John's Wort dominated the effort for the month (63% of total effort) and are also the weeds receiving most effort in the season to date, followed by Saffron thistles and miscellaneous Broadleaf weeds. 75% of total effort for the month was spraying. June weed control was dominated by Saffron thistles, with spraying of emerging rosettes (to get a head start for spring) and bagging of those plants that managed to reach maturity. Significant effort was also spent grubbing Broadleaf weeds and Verbascum in high value areas on the Reserve. Together these accounted for 85% of the June effort. The season to date has been dominated by Saffron thistles, St. John's wort, Verbascum and the grouping of thistles other than Saffron thistles, all of which have received more than 160 hours of effort. The total effort for the season to date was 10% less than that for the same period last season, but we are confident the the high priority weed are being adequately controlled. Effort on the Reserve was 63% of the total effort. David Tongway, a member of fotpin since its inception, was honoured by being made a member (AM) in the General Division of the Order of Australia today. His award was for "significant service to science and research in the area of land management through the development of Landscape Function Analysis". Indeed it is just such a service that David has provided to fotpin, training other members in LFA and overseeing it's application on the Pinnacle Nature Reserve, as well as advising generally on, and assisting with implementation of, erosion control. He has also given his time to provide similar assistance to other ParkCare groups. David has been an eager and active participant in other fotpin activities as well, as far as permitted by his busy schedule travelling Australia and the World applying his unique methodology. Congratulations David for contributions deservedly honoured today. May weed control was dominated by Verbascum and thistles (both Saffron thistles and all other thistles), together accounting for 71% of the total effort. Miscellaneous Broadleaf weeds, St. John's wort and Nightshade were the only other weeds receiving significant attention. The total effort for the season to date was 11% less than that for the same period last season, but we are confident the the high priority weed are being adequately controlled. Effort on the Reserve was 63% of the total effort. April weed control was dominated by thistles other than Saffron thistles and Briars, which contributed 62% of the total effort. Verbascum, St. John's wort and Horehound were the only other weeds receiving significant attention. The season to date has been dominated by St. John's wort, Saffron thistles, the grouping of other thistles and Verbascum, all of which have received more than 100 hours of effort. The total effort for the season to date was 14% less than that for the same period last season, but we are confident the the high priority weed are being adequately controlled. Effort on the Reserve was 69% of the total effort. Our annual Autumn walks and events program has just been finalised and kicks off on 17th April. It includes the ever-popular bird walk led by John Brannan (17th April), a small planting event to enhance the shrublayer and groundcover along the track leading down to the dam (26th April), and a new walk focussing on sharing with participants photographic evidence of the changes to the Reserve since the park care plantings in the 1990s as well as more recent plantings, showing some of fotpin's progress and challenges in the battle against invasive weeds and with erosion and feral pest management. For more details, see What's on or the walks poster [ 273 kB]. March weed control was dominated by thistles other than Saffron thistles, Verbascum and miscellaneous Broadleaf weeds. The same weed types dominated the season to date with the addition of by Saffron thistles and St. John's wort. The total effort for the season to date was 15% less than that for the same period last season, but we are confident the the high priority weed are being adequately controlled. Effort on the Reserve was 76% of the total effort. February weed control was dominated by Verbascum and St. John's wort, the former flourishing after the wet December and January and the latter having an extended season for the same reason. The season to date has been dominated by Saffron thistles and St. John's wort. Significant effort has also been spent on the Verbascum thistles other than Saffron grouping, Paterson's curse, combined miscellaneous broadleaf weeds, Briars and African lovegrass. The total effort for the season to date was 19% less than that for the same period last season; effort on the Reserve was 77% of the total effort. Thanks very much to those who answered the call to help clean up the Reserve on "Clean Up Australia" day last Sunday (1st March). 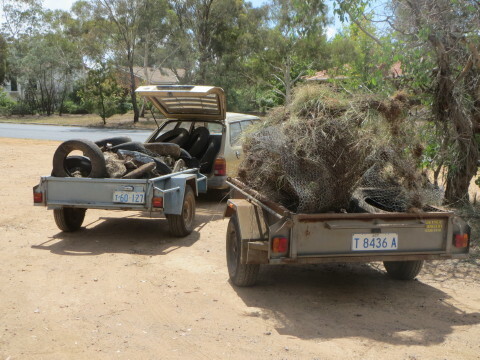 Our primary target was collection of old rubbish left on the Reserve since before it was established (old sheets of iron, old fencing materials,builders rubble, etc) as well as more recent rubbish such as car tyres. It was pleasing that there was not too much general litter, the result of a combination of the responsible attitude taken by most of the Reserve users and the diligent efforts on a regular basis by other Reserve users who remove any litter they find. We surprised both ourselves and Parks with the amount of rubbish, seen below, that needed to be taken away for disposal. January weed control was dominated by St. John's wort, Briars and Saffron thistles, which together accounted for 71% of the 158 hours of effort for the month. The season to date has also been dominated by Saffron thistles and St. John's wort. Significant effort has also been spent on the thistles other than Saffron grouping, Paterson's curse, combined miscellaneous broadleaf weeds, Briars, Verbascum and African lovegrass. The total effort for the season to date was 33% less than that for the same period last season; effort on the Reserve was 78% of the total effort. The weeding effort for the first six months of the 2014-15 weeding season has been summarised. The total effort for the season to date is 40% less than that for the same period last season; effort on the Reserve was 71% of the total effort. Effort for December (52 hours) was the lowest in the last 5 seasons. The main weed types on which effort was spent in December were (in order, largest effort first) St. John's wort, African Lovegrass, Verbascum, Saffron thistles and miscellaneous Broadleaf weeds. For the season to date the main weed types have been Saffron thistles, St. John's wort, the grouping of Thistles other than Saffron thistles, Paterson's curse, miscellaneous Broadleaf weeds and Verbascum. The weeding effort for the first five months of the 2014-15 weeding season has been summarised. The total effort for the season to date is 28% less than that for the same period last season (42% less for the Reserve only). Effort on the Reserve was 68% of the total effort. The main weed types on which effort was spent in November were (in order, largest effort first) St. John's wort, Saffron thistles, Paterson's curse, and Verbascum, while for the season to date they have been Saffron thistles, the grouping of Thistles other than Saffron thistles, Paterson's curse, St. John's wort, miscellaneous Broadleaf weeds and Verbascum. The series of monthly reports on weeding effort for the season have commenced for 2014-15. Total effort is down30% on last season, partly because of decreased prevalence of many of the regular weed targets and partly because of unavailability of some of the members of the weeding team. The main weeds treated so far this season have been Thistles, primarily Saffron thistles, which we are continuing to try to get on top of, but also Slender thistles, which have increased in prevalence this season. For full details, see weeding effort for 2014-15. A brief (7 minute) video featuring members of ParkCare groups and Rangers has been produced and can now be viewed on YouTube. As well as providing a brief background to ParkCare, it features members discussing the various approached to and rewards from ParkCare activities. Worth a look to see what other groups have been up to. Our annual Spring walks program has just been finalised and kicks off on 19th October. It includes a reprise of two very popular walks from Autumn, namely an indigenous heritage walk led Wally and Tyronne Bell of the Ngunawal people, and a walk led by PCS Ranger and Assistant Parkcare Coordinator Craig Wainwright delving into historical land use as well as present day management of the Reserve. And of course there is the ever-popular bird walk led by John Brannan. For more details, see What's on or the walks poster [ 1.1 MB]. Celebrating 25 years of ParkCare and Landcare in the ACT is about recognising the places we've come to love and look after, the details of nature that create a sense of wonder and the people associated with this important social and environmental movement. What better way to celebrate and promote 25 years of ParkCare than to have a photo competition? The top ten photos will create a roving display with the intent of capturing and inspiring a future generation of ACT ParkCarers and Landcarers. For more information, see: Competition Announcement [ 241 kB], Competition Rules [pdf 406 kB] and Competition Entry Form [doc 24 kB]. After a lapse of a couple of years, the fotpin newsletter is back reinvigorated under the editorial oversight of Elizabeth Smith. The theme for this month's newsletter is Autumn walks at the Pinnacle. It contains descriptions of three very diverse guided walks at the Pinnacle Nature Reserve this Autumn: a Bird Walk; an Indigenous Heritage Walk; and a European Heritage Walk, which are prefaced by an overview of the delights of Autumn at the Pinnacle. Don Driscoll presented a summary of the results of the "Grass Experiment", as it's better known, at the fotpin AGM in July. Because many were unable to attend, or would just like to review it again, a self-explanatory version of the presentation can be viewed on the website. The 4th fotpin AGM was held on Sunday 20 July at the Weetangera Primary School. The meeting was attended by 17 people including 13 members and 2 representatives from the ACT Parks & Conservation Service. The business part of the meeting was preceded by a presentation of the results after three years of fotpin's Native Grass Regeneration Project "Defeating the Weed Menace" by its leader Don Driscoll. A brief summary of his talk is included in the Minutes of the AGM which may be accessed from the link below, and a more detailed summary is on the latest results page. For draft Minutes of the meeting and and the annual Financial Statement presented to the meeting, see the governance page. Thank you to all the fotpin members who gave their time and effort to controlling weeds on the Pinnacle Nature Reserve in the season past; there are definite signs that we are making progress, which the analysis of the weeding effort data collected allows us to explore. In a few weeks' time, an analysis of the whole four seasons of weeding effort and chemical usage data will be presented which allows an even better view of where we are making progress and where we are not. Effort for the 2013-2014 weeding season was 1215 hours, only 10 hours less than last season. However, more effort was spent controlling weeds in the Reserve this season (876 hours, an increase of 20%), with less effort being spent in the neighbouring paddocks. The effort required to maintain effective control of most weed types decreased this season, which is hopefully a sign that our control measures are having an impact, although climatic factors cannot be ruled out. Examples of these include Verbascum, Thistles other than Saffron Thistles and Horehound. One weed type that is not showing signs that we are controlling it is Saffron thistles. This weed type absorbed a worrying 26% of our total effort this past season and we have yet to see a lasting effect of this effort. These different ways of viewing the effort data all contribute to analysing the progress of our weed control and helping to plan our control in future seasons for maximum effect. The weeding effort for the first 11 months of the 2013-14 weeding season has been summarised. Effort for May was 137 hours (the busiest May we've had), and the total effort for the season to the end of May was 1183 hours. 73% of the season's effort so far (140 hours more than last season) was spent on the Reserve. The main weed type consuming our time in May was Saffron thistles (65 hours, 48% of total effort for the month). Other weeds treated were miscellaneous Broadleaf weeds (mostly Fleabane and Flat weed) (27 hours), Paterson's curse (23 hours), Thistles other than Saffron thistles (8 hours), African lovegrass (6 hours) and Nightshade (5 hours). Thanks very much to everyone who turned out on Sunday to assist in the annual count of the kangaroo population on the Pinnacle Nature Reserve and neighbouring paddocks. Conditions were at times quite miserable with scattered light showers and the temperature hovering around 10 degrees, but this didn't deter our enthusiastic participants in this important annual event. As usual, we conducted a morning and afternoon count, and as usual the results were quite close. The preliminary results posted here yesterday have now been finalised and are: morning: 763; afternoon: 780, giving an average of 772 and a difference between the two counts of only 2.2%. This is the closest the morning and afternoon counts have ever been in our 4 years of counting. This year's count is identical to the average count of 772 obtained in May 2011, before any culling, and higher than the count in August 2013 (after the annual cull) of 650. Thanks to Mel, Claire and Natasha from the Environment and Sustainable Development Directorate of the ACT Government for their expert and patient assistance with the count once more. For more information see the brief description of the count with a few photos, and a summary of our count history and results on the kangaroos web page. It was brought to fotpin's attention the other day that this report is available from their website. A copy is also on our website: ACT Conservation and Planning Research Program Report 2011-13 [ 3.8 MB ]. The ACT's Conservation Planning and Research unit provides science and research evidence within government to inform environmental conservation, policy, planning and management. This includes legislative requirements under the Nature Conservation Act 1980 and the Planning and Development Act 2007. This report summarises 57 projects spanning all of the elements of the unit; flora, fauna, aquatic ecology and conservation planning. It includes summaries of projects being carried out, in part, on the Pinnacle Nature Reserve, such as reptile monitoring (page 39), and assessing the grazing pressure of kangaroos (page 38). The weeding effort for the first ten months of the 2013-14 weeding season has been summarised. The total effort for the season to the end of April was 1046 hours, 72% of it spent on the Reserve (48 hours more than last season). The main weed types consuming our time in April were Paterson's curse (33 h), Briars (23 h), St. John's wort (21 h), Verbascum (16 h) and Thistles other than Saffron thistles (16 h). The main weed types on which effort has been spent so far this season are (in order, largest effort first) Saffron thistles, St. John's wort, Paterson's curse, Verbascum, Briars and miscellaneous Broadleaf weeds. These six weed types have accounted for 83% of our effort. Yesterday (April 23rd) fotpin's weed control effort for the 2013-14 season reached 1002 hours. This is the third season in a row that we have exceeded 1000 hours (with the season before that only just missing out with 943 hours). The total weeding effort since we began keeping records in July 2010 is now more than 4500 hours. And this season isn't over yet! Congratulations and thank you to all our fotpin weeders. See the weeding effort page and associated links to maps and charts for more details of this season's effort up to the end of March. Figures for the period to the end of April will be updated in about 2 weeks' time. The weeding effort for the first nine months of the 2013-14 weeding season has been summarised. The total effort for the season to date is 6% less than for last season, although a larger amount of effort has been spent on the Reserve than last season. The main weed types on which effort has been spent so far this season are (in order, largest effort first) Saffron thistles, St. John's wort, Verbascum, Paterson's curse, Briars and miscellaneous Broadleaf weeds. These six weed types have accounted for 95% of our effort. Our annual Autumn walks program is still being finalised, but it kicks off on Sunday 6 April with John Brannan's bird walk. Details of the remaining walks are currently being finalised. They will include a walk led by two local aboriginal leaders, Wally and Tyronne Bell, and a walk led by PCS ranger and Assistant Parkcare Coordinator Craig Wainwright. Keep watching our news headlines for details as they become available. Our weeding effort has been summarised for the first eight months of the 2013-14 weeding season. The total effort for the season to date is 5% less than for last season, although a larger amount of effort has been spent on the Reserve than last season. February was a relatively quiet weeding month, most weeds having already been treated and few new weeds appearing or being dead or dying as a result of the very dry conditions (there having been less than 40 mm of rain in the 3 months to mid-February). The greatest effort in February (32 hours; 55%) was spent on Briars, most of which were still growing vigorously enough to respond to herbicide treatment. The remaining 55% of February's effort was spread across 10 different weed types. The weeding effort for the first seven months of the 2013-14 weeding season has been summarised. The total effort for the season to date is almost exactly the same as for last season, although a larger amount of effort has been spent on the Reserve than last season. The main weed types on which effort was spent in January were (in order, largest effort first) Saffron thistles, Briars, Verbascum, and other thistles, while for the season to date they have been Saffron thistles, St. John's wort, Verbascum, Paterson's curse, Briars and miscellaneous Broadleaf weeds. One of fotpin's target weeds for many years has been Verbascum. We have spent many hours over several years lopping and bagging seed heads and grubbing rosettes. For the last two years there has also been an intensive spraying campaign. We are now starting to see signs of a reduced level of infestation. While mostly that is based on memory, there is one place where we can assess the reduction in Verbascum by photographic evidence. The contrast between the original photo in December 2007 and photos taken in 2013 is stark. This provides evidence that we are indeed winning the battle for control of Verbascum on the Reserve. Towards the end of 2013 the Conservation Planning and Research, Natural Policy Branch of ACT Environment and Sustainable Development, in conjunction with members of fotpin, carried out a survey vegetation condition, including the occurrence of rare plants, for The Pinnacle Nature Reserve. This was part of a larger survey across the ACT. Comparison of the condition survey with one carried out using the same methodology in 2003 showed an improvement in overall condition. A total of seven rare plant species have been identified to be present on the Reserve. See the vegetation condition page for more information including maps of the condition in 2003 and 2013 and details of the changes observed.